The Jeep Cherokee, Wrangler, Patriot and Compass each logged their best ever U.S. sales in the month of January. U.S. light-vehicle sales rose 14 percent to 1.15 million in January, driven by low gasoline prices that fueled truck sales and signaled another year of growth for the industry. GM, Ford, Fiat Chrysler, Nissan, Toyota and Honda all posted gains of at least 12 percent, with General Motors’ 18 percent advance leading the pack. Among smaller brands, Subaru carried its hot streak into the new year while demand for Volkswagens remained cool. The seasonally adjusted pace of light-vehicle sales came in at 16.7 million, well above forecasts of 16.5 million, in a sign that U.S. consumers are poised to deliver a sixth straight year of sales gains. It was the fastest January pace in nine years and up sharply from a 15.3 million rate a year earlier, when severe weather curtailed showroom traffic. The jump in light-truck sales across the industry -- 19 percent -- easily outpaced the 7.8 percent rise in car deliveries last month. The increase at GM came on a 42 percent gain in pickup volume and 36 percent rise in crossover and SUV shipments. Sales advanced 29 percent at GMC, 20 percent at Chevrolet and 2.6 percent at Cadillac. Volume slipped 5.5 percent at Buick. GM said its retail sales increased 14 percent and fleet shipments advanced 32 percent. “Consumers feel very good because more people are working, the U.S. economy is expanding and fuel prices are low,” said Kurt McNeil, U.S. vice president of sales operations for GM. At Ford Motor Co., volume rose 16 percent on a 16 percent gain at the Ford division and 11 percent increase at Lincoln. Nissan Motor Corp. reported January U.S. sales of 104,107, a gain of 15 percent, with deliveries rising 16 percent at the Nissan brand and 7.3 percent at Infiniti. The company's light-truck deliveries rose 16 percent. And Toyota Motor Corp. said sales rose 16 percent, with light trucks and Lexus setting January records. Volume advanced 12 percent at Honda Motor Co. as light-truck deliveries surged 25 percent to a record 52,169. Sales increased 12 percent at the Honda brand and 11 percent at Acura. Volkswagen of America’s January deliveries were essentially flat from last year, gaining just 10 units. Sales of the Golf compact lineup more than doubled to 4,199 but were offset by lower demand for every other VW model except the Passat, which posted a small gain. Sibling brand Audi, meanwhile, recorded a 14 percent advance, in what the company says was its 49th consecutive month of record U.S. sales. The A3 compact lineup -- not on sale this time last year -- added 2,383 units to Audi’s tally, helping offset a 29 percent decline in A4 sales and a 31 percent drop in Q7 sales. At Jaguar Land Rover, U.S. sales totaled 6,547 units, a 9 percent increase. Land Rover volume reached 5,281 units, up 13 percent, while Jaguar sales slipped 6 percent to 1,266 units. Fiat Chrysler posted a 14 percent increase in U.S. sales in January, matching forecasts, on another month of robust deliveries for the Jeep and Ram brands. Volume rose 23 percent at Jeep, 21 percent at Ram, 11 percent at the Chrysler brand and 1.3 percent at Dodge and 1 percent at Fiat. 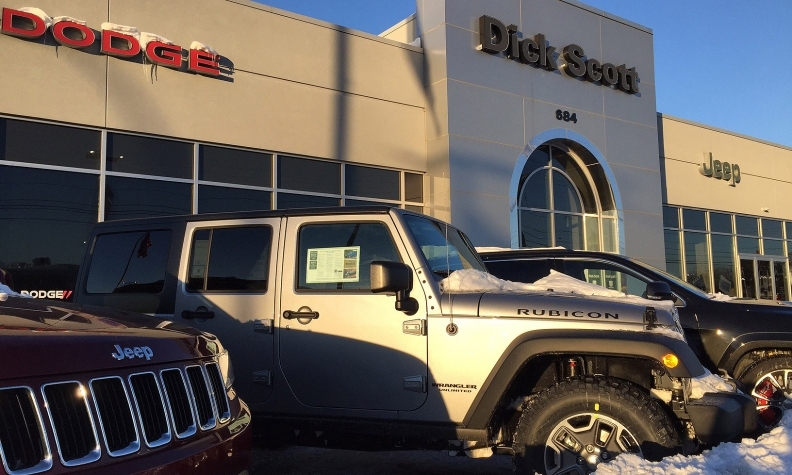 Jeep deliveries set a January record of 51,523 units, FCA US said. The automaker’s first sales report of 2015 marks its 58th consecutive month of increases. “In spite of some tough 2015 comparisons, we remain confident in our ability to post year-over-year sales increases on the back of strong retail demand for our products,” Reid Bigland, head of U.S. sales for Fiat Chrysler, said in a statement. Overall, Fiat Chrysler’s light-truck sales climbed 13 percent while car sales rose 17 percent. Subaru of America continued its red-hot streak with January sales rising 24 percent to 40,812. It is the 11th consecutive month the company's U.S. volume topped 40,000 units. The Forester, Outback and XV Crosstrek crossovers, as well as the WRX/STI performance models and Legacy sedan, each recorded their best January U.S. sales, Subaru said. “We are off to a strong start to 2015 by having the best January sales in our franchise’s history and we expect strong demand to continue throughout the year,” said Tom Doll, COO of Subaru of America. Going into today, light-vehicle sales were forecast to rise 14 percent above a year earlier, when the coldest January in two decades across the contiguous U.S. states kept U.S. consumers largely out of showrooms. The CR-V was Honda's top-selling model with record monthly sales of 23,211 units, up 27 percent over January 2014. †Fiat completed the merger with Chrysler Group under holding group Fiat Chrysler Automobiles on Oct. 12, 2014; Fiat Group and Chrysler Group sales totals for 2014 are combined under Fiat Chrysler Automobiles. Separately, AutoNation Inc., the country’s largest dealership group, reported retail sales of 23,355 new vehicles last month, an increase of 20 percent over January 2014. Jackson said the big sales story continues to center around low gasoline prices, which are supporting strong truck and luxury-brand sales. The improving U.S. job market and falling gasoline prices will likely add 200,000 more light-vehicle sales this year than analysts estimated just two months ago, according to a new survey by Bloomberg. After a strong finish to 2014 -- November and December were two of the year’s three best months -- most analysts surveyed by Bloomberg raised their 2015 estimates, increasing the average projection to 16.9 million deliveries. As recently as mid-November, analysts estimated 2015 light-vehicle sales would rise about 200,000 to 16.7 million. “Number one, the U.S. economy is showing more strength today, and we adjusted our figure based on the jobs reports,” said George Magliano, senior principal economist at IHS Automotive and an analyst who contributed to the survey. “Number two, energy and oil prices falling are a big boost for consumer confidence, and people are going out and buying cars and trucks,” Magliano said. Kelley Blue Book said today the average transaction price for light vehicles in the U.S. rose 5.2 percent to $33,993 in January 2015 from a year earlier. In addition to employment gains, low gasoline prices and healthy rebates, especially on cars, rising consumer confidence is giving another jolt to industry volume. 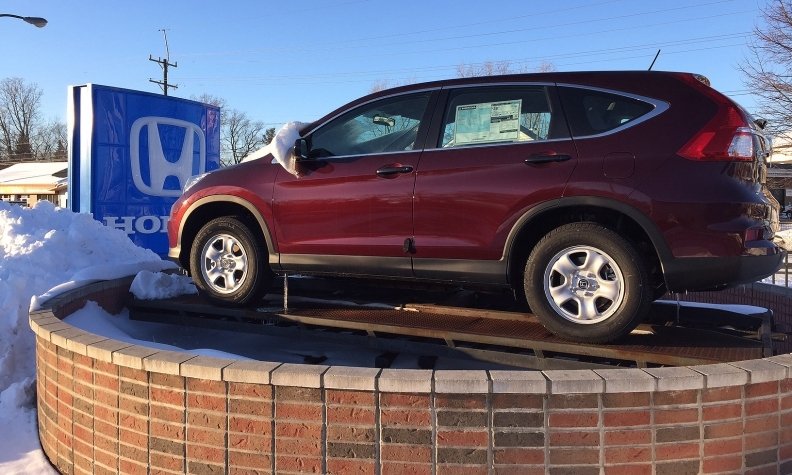 At Taylor Chevrolet in Lancaster, Ohio, new-vehicle sales manager Matt Pugh cited $2 a gallon gasoline prices for a lift in deliveries last month. "I sold four more units this year," Pugh said, adding the 2015 Cruze and Equinox, and the 2014 Silverado, were top sellers at the dealership for the month. January is typically a slower sales month, as it usually follows a wave of holiday discounts and promotions that drive deliveries. Sales were particularly strong in November, when the annualized rate reached 17.2 million, and December, when it was 16.9 million. Early in 2014, severe winter weather suppressed new-vehicle demand. But the sales lost in January were made up in later months, and 2014 light-vehicle sales eventually totaled 16.5 million, the most since 2006. Amy Wilson, Ryan Beene, Diana T. Kurylko, Hannah Lutz and Bloomberg contributed to this report.